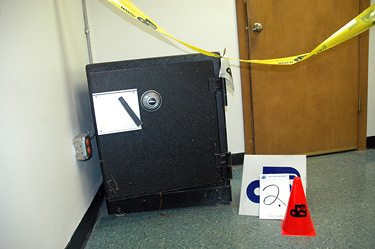 Drum Corps International employees arrived to work today to find that during the overnight hours, someone or a group of individuals had rappelled through an open skylight and had made light work of accessing the confidential DCI Safe, used to store valuable documents and historic artifacts. 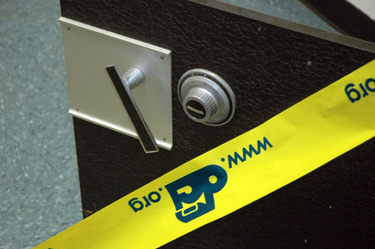 Mark Goodmanson, Drum Corps International's Operations Director commented: "Well the joke's on this thief since we don't keep anything of monetary value in our safe. 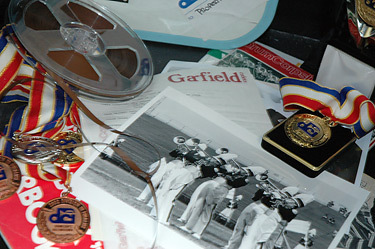 But for the diehard drum corps fan, the safe contains a virtual treasure trove." 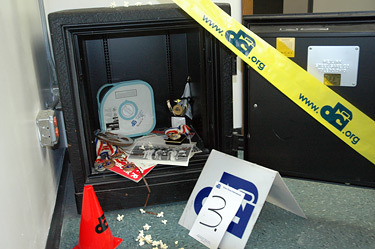 While Drum Corps International Executive Director Dan Acheson has yet to release an official statement outlining the extent of items stolen, several documents related to the 2007 Classic Countdown, which will appear in select movie theaters across the country tomorrow, April 26, are allegedly among those missing. 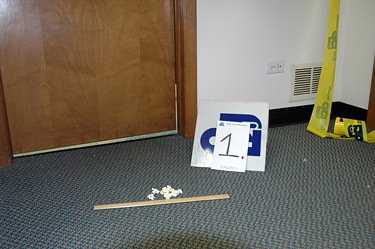 Staffers have few leads up to this point in time, however, with remnant popcorn kernels found littered around the crime scene, a movie-crazed fanatic is expected to be the culprit. Longtime Drum Corps International Contest Coordinator and office security consultant Tony DiCarlo is on his way to the scene to assist in the investigation, along with several "associates." DiCarlo stated: "I believe that information about the 2007 Countdown has the potential to be leaked anywhere, and drum corps fans should be cautious for any documents that may let the cat out of the bag as to the corps who will appear in tomorrow's movie theater event. We cannot guarantee their validity as several different adjudication sheets were in the same confidential file." More information will be posted as it becomes available. Crime scene photos follow.